November 13, 2017. Jim has advised Duckling is FOR SALE. Below is a copy of his ad and contact info. On trailer in El Grenada $5850. Two axle trailer, radios, many sails and accessories included. Deteriorating eyesight provokes sale. 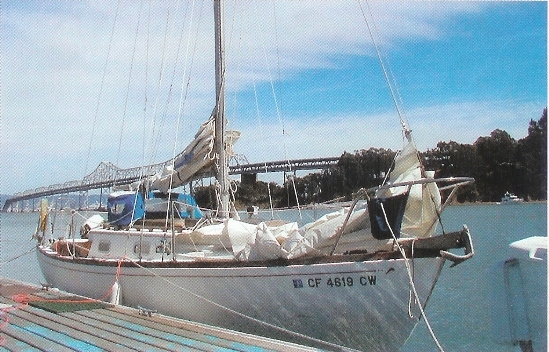 Classic S&S design, stable and sea-kindly in SF Bay. 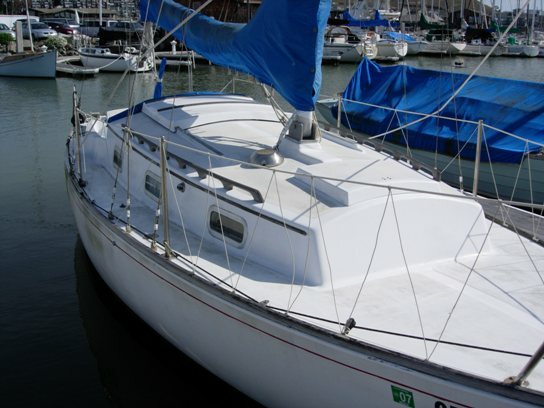 Shoal draft, swing centerboard, club-foot jib for easy tacking, Bruce & Danforth anchors, custom step and rigging for safe single-handed mast handling. 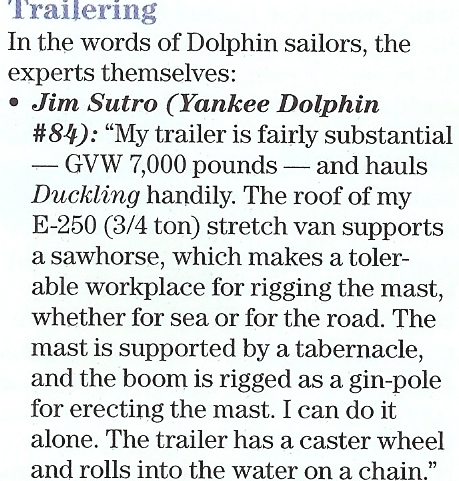 6hp Sailmaster OB on transom, solid-fuel heater, kero two-burner stove, portable-potti. Hull clean, no blisters, needs bottom paint. We've gotten wildly sidetracked by "Land Yachts" these days. My wife just isn't too keen on sailing, mostly I think because the arrival time is so unpredictable. So we're playing with an Airstream trailer these days. Retirement is just a few months away, so there should be more time for playing with toys. Many of my retired friends say that's a myth. I should check in with your great web-site now and then. So many toys, so little time. . ..